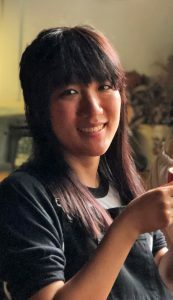 Our guest writer for this 2 part blog series is Jiny He from Mykorisa Design. 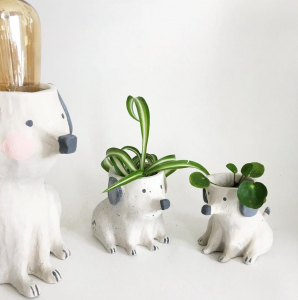 With a passion for nature, sustainability and the environment Jiny shares some of her expert tips and advice on using greenery in the home. What a time to live in! Our lives have improved so much with the advancement of technology. We can work from home, explore the world from our screens, and even shop for groceries without ever having to put on pants to go outside. As we spend more and more time indoors, what changes? Our interaction with nature became limited. Throughout history, nature has always played an important role in our lives, especially plants that act as our guardians, providing us with oxygen, food, and protection. Trees purify our air and flowers adorn our environment. We innately yearn for greenery. The bottom line is, we need to be with plants! And there is nothing more aesthetically pleasing than an organic sculptural plant. If that’s not convincing enough, research has shown that even having a small desk plant may boost productivity! Just a quick glimpse at your desk plant will give your eyes a well-deserved little break and help restore attention. 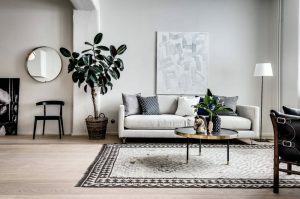 With all these benefits and our growing need for interior greenery, it is no surprise that working a few pieces in when staging a house for sale will provide unlimited benefits. Plants add a fresh look to your space and may even help boost buyers’ mood. Now you’re ready to jump on board with greenery, the thousands of plant varieties out there could get a bit overwhelming. To make it easy and for convenience, we have compiled 5 tips on how to use greenery to boost your staging needs right here. 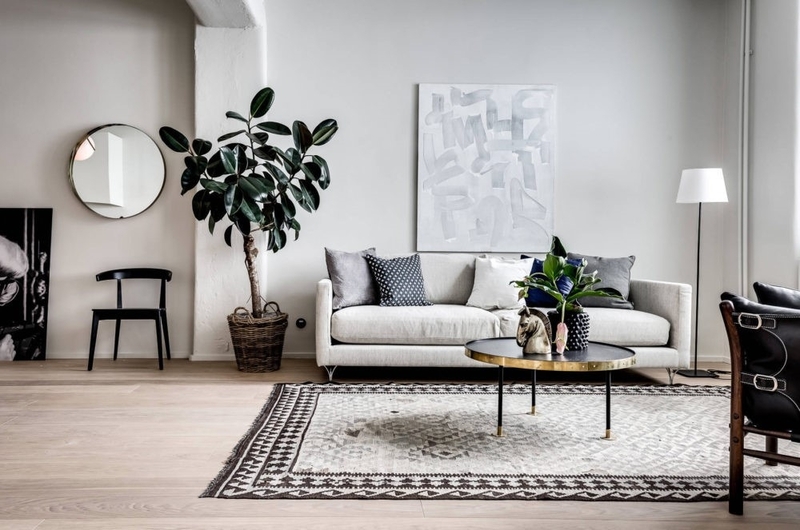 Styling plants against any hard materials, such as marble, tiles or concrete not only adds a pop of colour, but also balances the feeling of rigidity inherent to these cold surfaces. The key word here is accentuate. It’s easy to get excited and want to use every thriving plant with luscious foliage. For your personal homes, I say yes please! But for staging, curate and edit. Sometimes all you need is a single cut stem and your story is complete. 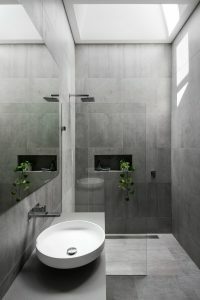 Just look at this perfectly executed home by Dalecki Design, the draping Pothos in the bathroom adds such a sense of movement and life, under the perfect light, the brilliant green glistens against the grey without overpowering the scene. In the kitchen, the single-stem Monstera works to soften the modern straight lines, adding a sense of relaxation and calm, echoing the green outside. So now you have found a place to dress up with a bit of green, which plant should you use? Think back to your space. 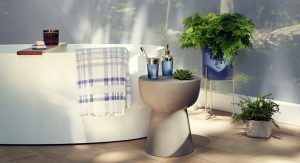 Are you styling a side table, filling a large vertical empty space, or adding a touch of freshness to a bathroom? For a side table, consider smaller plants, such as ferns or succulents. The ever popular Maidenhair Fern is beautiful in appearance but a diva in watering demands. Luckily, they stay lush for a few solid weeks before showing symptoms of disapproval. It’s always a good idea to keep an eye out for signs of a dying plant as we want to add freshness rather than deter with a sad wilting plant. For tall empty spaces, the go-to option for most is the Fiddle Leaf Fig. If you want to get creative try a small Banana Tree or a Bird of Paradise. 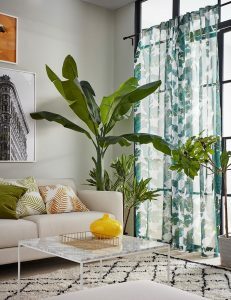 Their long large leaves are immediately reminiscent of the tropics and bring in a relaxed and warm feel. For classic homes, a potted olive or lemon tree elevates the elegance and sophistication. 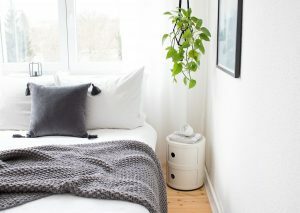 For smaller areas such as the bedroom or bathroom, create movement with vines like the Golden Pothos or String of Hearts. Small plants work well in these spaces to suggest a hint of life and positive energy. Once you find your star plant, finding the right planter is like finding the perfect shoes for your outfit. It could make or break your whole look. This is where you can get creative and tie in the rest of the space with the right accessories. 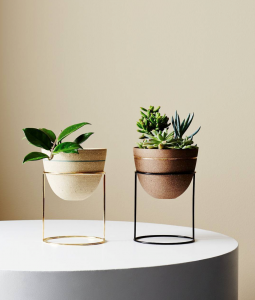 For a modern look, you can go contemporary and chic with a planter and stand combo like the Nest from Ivy Muse. Why not add some quirk if the space allows for a more artistic approach. Weaved baskets add a relaxed and coastal vibe. 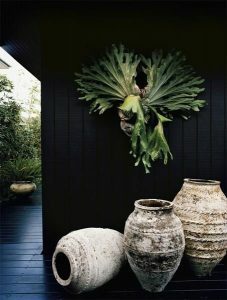 How about mounting a Staghorn Fern as living art, or create some negative space with a glass jar. This is where you can have some fun and really build personality and charm.